We have installed the Taylor Cable Products Helix Power Tower PLUS on our 2011 Ford Raptor 6.2 engine. Utilizing multiple aerodynamic principles, the Helix Power Tower Plus (U.S. Patent Number 7,055,513) produces air breakup, and turbulence, that yields greater fuel burn efficiency, which translates into the better performance. The Helix Power Tower Plus is CNC crafted from T-6061 aircraft quality solid-billet aluminum. Installation is simple and may be done in as little as 45 minutes. Installation is very easy and if it takes you 40 minutes to do you must have taken a break. With my truck it was super easy because I have the K&N Air Intake installed. Just remove the air intake system, take the bolts out of the throttle body, and the throttle body can be moved out of the way to let you install the spacer. Make sure the gasket is between the spacer and the throttle body, and the grooved parts of the spacer are facing towards the throttle body when you install everything. Tech tip: Take the time to clean your throttle body and your mass air sensor with the proper cleaning solutions while you have everything apart. Install everything as indicated in the instructions and take a test drive. CNC crafted from T-6061 aircraft quality solid-billet aluminum. Easy to install with minimal tools. Reasonably priced for a quality built product. Fair performance results with fair fuel mileage increase. When it comes to trying to get better fuel mileage along with more performance from our 2011 Ford Raptor with the 6.2 gas engine, we jump on that chance every-time we can. So when Taylor Cable Products offered to let us try out their new Helix Power Tower throttle body spacer we said yes. 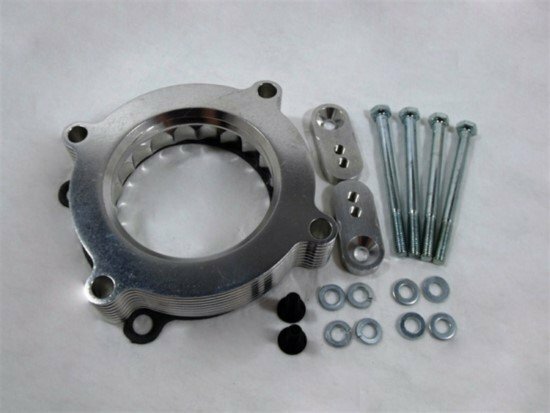 The throttle body spacer is very easy to install and can be done with minimal tools and in your garage at home in less then an hour. As you can see our job was made easier because we have the K&N Intake System installed. This allowed us access to our throttle body by merely removing the air intake tube & unbolting the throttle body. You simply install this unit, and you are ready to start saving at the gas pumps immediately. After we install any component we test for seat of the pants performance increase, and check our gas mileage as well. I found that my gas mileage increased slightly, and it felt to me like we picked up a slight increase in performance too. Unfortunately we do not have a dyno at our disposal to check the numbers before and after the installation. I personally think if you have a carburated vehicle this might work much better for that application, but that is just my opinion. The bottom line is this is an inexpensive way to get a little bit more out of your engine and can be done for a very reasonable price. What have you got to loose, an hour of your time and a few bucks to squeeze just that much more out of your vehicle, go ahead and give Taylor Cable Products a chance to earn your business.